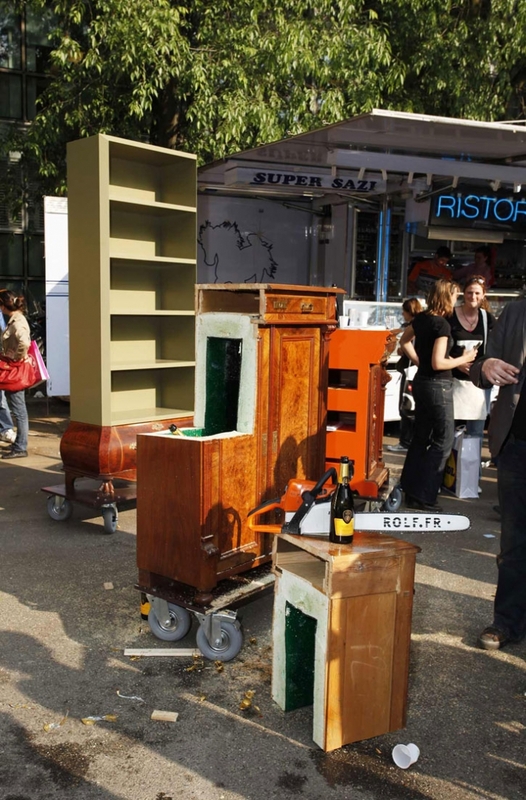 Today Rolf.fr sent us a super follow up of "Rolf.fr and his chainsaw" story that was published at Yatzer on the 7th of April, some days before the beginning of Milan design week. 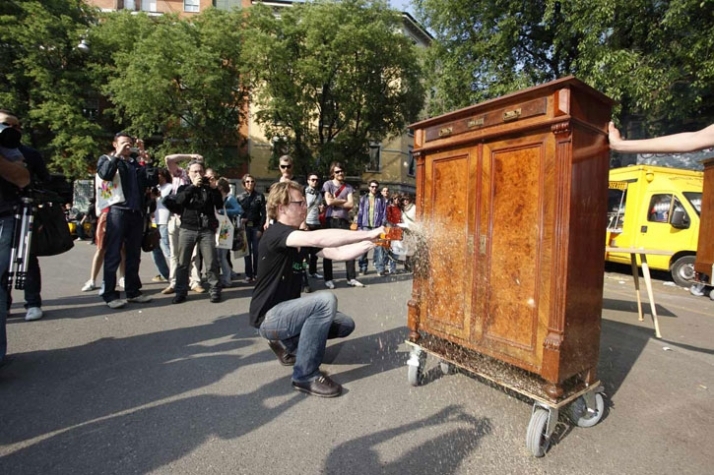 Thursday (23 April) afternoon a crowd was drawn by the loud noise a a chainsaw in via Tortona. 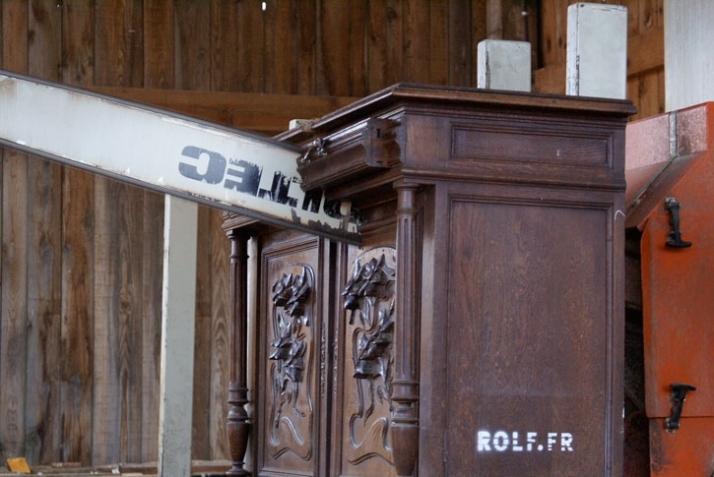 Rolf.fr was about to cut away a piece of an old cabinet. The violent action took only five minutes and was followed by applause and cheers. 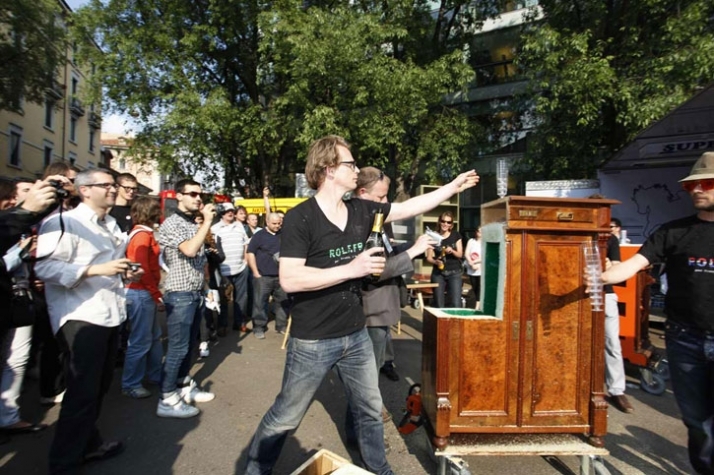 One quarter of the cabinet was removed and revealed dozens of bottles of Prosecco on ice in a cool box kind of construction. This made the hundreds of people cheer and clap even more. 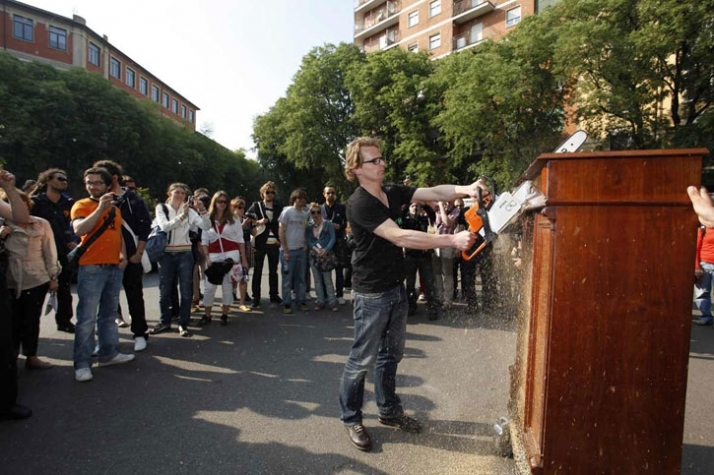 The distribution of the sparkling wine resulted in a typically italian traffic jam. 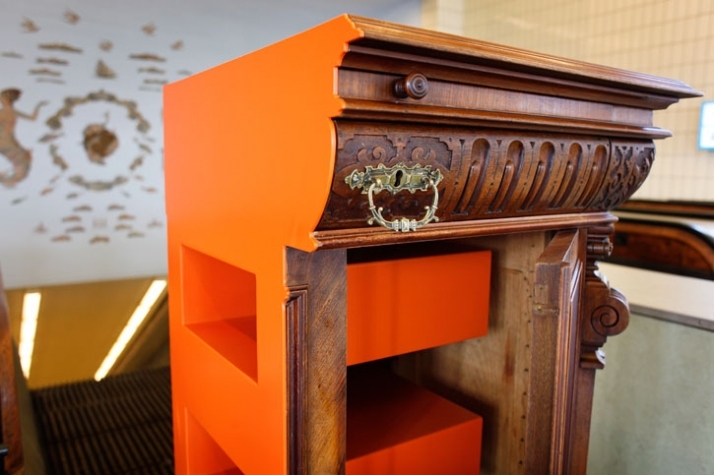 Rolf.fr chose to show his new pieces of furniture by walking them around the streets of Zona Tortona instead of doing so in a dedicated exhibition space. The choice was simple, on one hand there is the prohibitively expensive galleries where you have to be known to be invited to show your latest work, on the other hand the public space is attractive and unused. So it made sense for Rolf.fr as a new designer to go on the streets. Maybe a trend has been set, we'll have to see next year and anyway people liked it a lot. 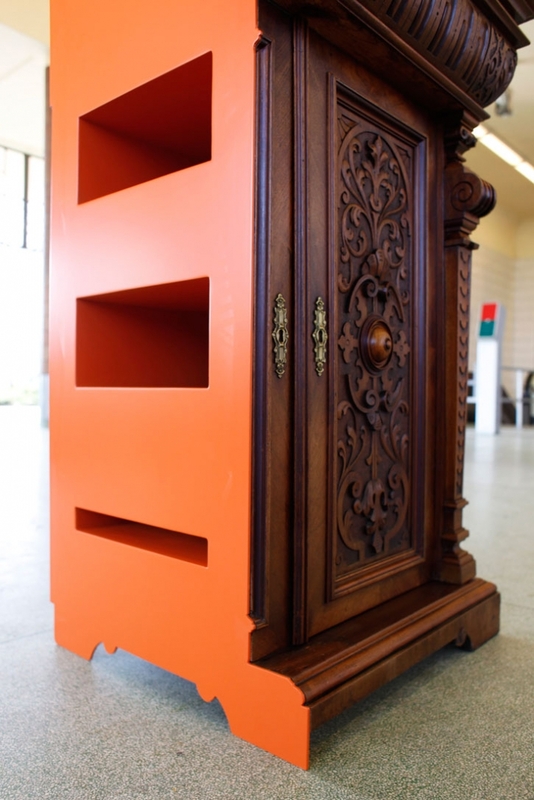 Rolf.fr is a furniture transformer. 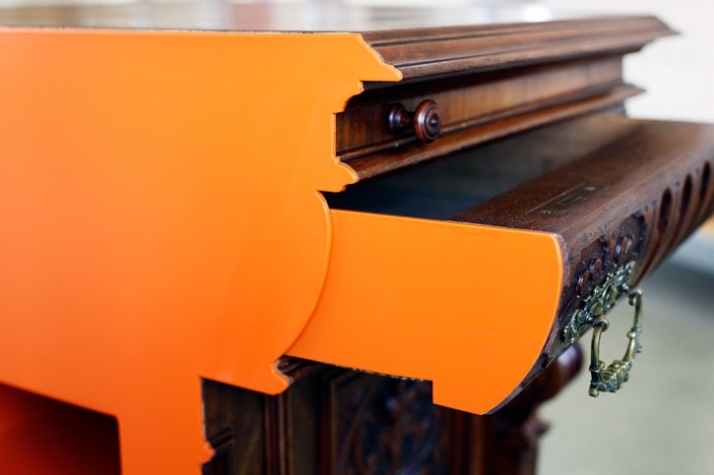 By cutting away parts and by adding new ones a piece of furniture gets a new span of life. The cutting is brutal and can impossibly be undone. Sometimes the cut is enough to make the piece of furniture adequate for a new function or space, sometimes a new part is required to do so. 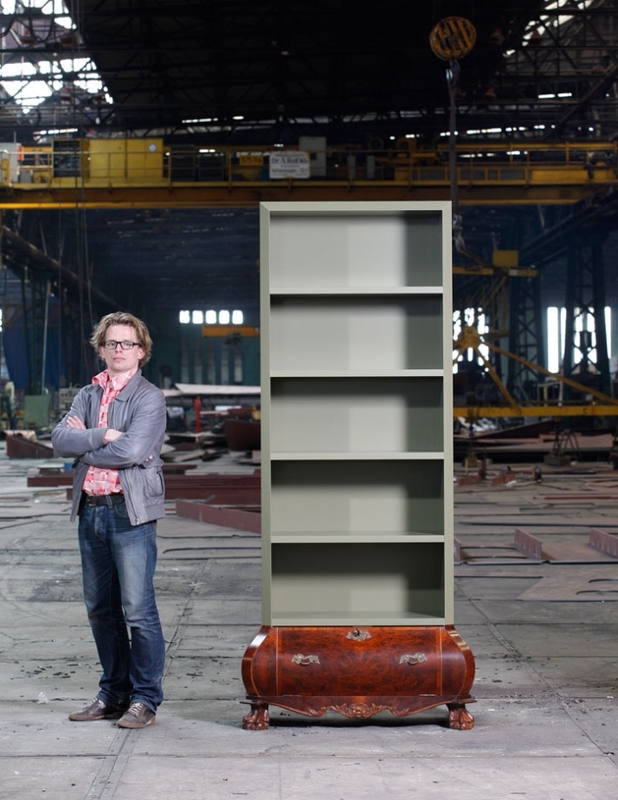 There is a category of traditional furniture that is nor antique nor really valuable. 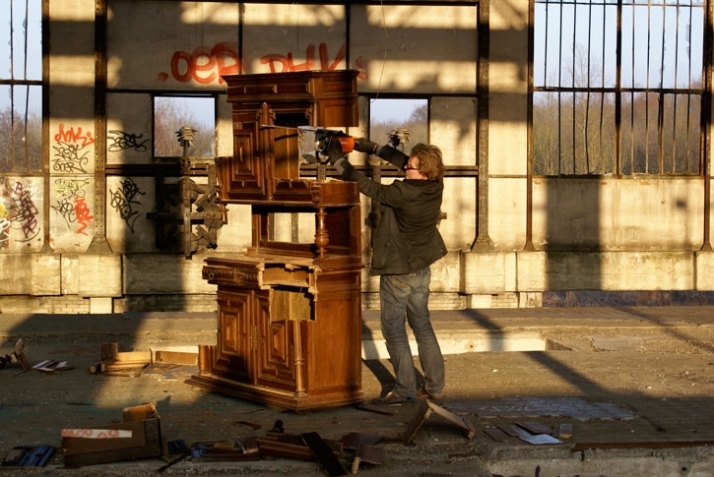 That traditional furniture is unwanted by younger generations but often inherited when older people pass away. 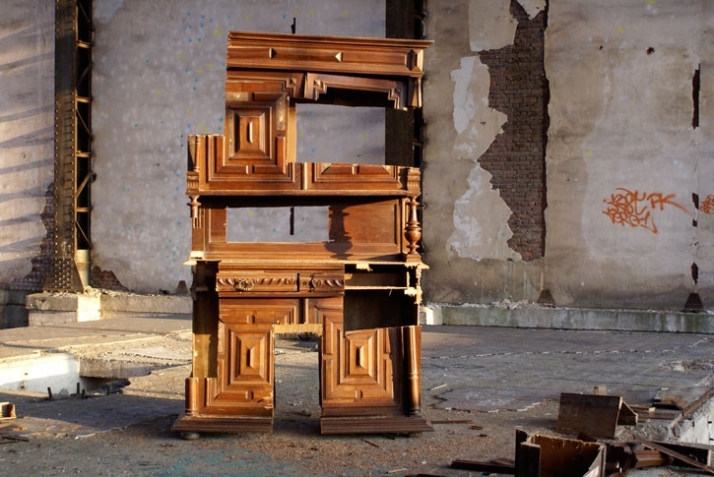 This furniture has a emotional value, but still we wouldn't like to have it in our interiors. By transforming them they can keep the emotional value and gain a place in our living space.